Reviews and thoughts from the music appreciation tentacle of Giant Squid Creations. Today I'm trying a new composer, for me, Sir Hamilton Harty, an Irish composer from the early 20th century. The album opens with his tone poem 'With the Wild Geese' which has you soaring, diving and swimming with occasional fights against the elements. It turns out, the work is prefaced by two poems by Emily Lawless, one about an Irish regiment fighting the French in the 18th century and one about the ghosts of fallen soldiers, so the moods evoked by my images of geese over bonnie Ireland were not what Harty was going for. Either way, the music is beautiful. The short fantasy 'In Ireland' comes next and is a happy ditty that also soars, with far fewer dives. The main piece on the album is Harty's 'Irish Symphony' and it certainly lives up to the name. Its four distinct movements take us once again soaring and diving, but in a pleasurable flight over Ireland, both its geography and its iconography. The beauty of land, the dances of its people, the richness of its culture. Its all there in what is a remarkable and delightful symphony. Following this discovery I turned to one of my favourite composers, the tragically undervalued Ippolitov-Ivanov, and his first symphony. I hadn't heard his symphony before so it was exciting to find it. It is brilliant, especially the sorrowful third movement and the cathartic joy of the fourth, but it feels a bit more formal than his other works. It's as if here he forced himself to conform to more classical notions and lost some of the ethereal beauty and evocative phrases I love in his shorter works. Not entirely, the very structure is a break from the "classical" symphony, and it is a beautiful work, just not as good, in my mind, as his sketches and fragments. The recording, a 2015 album by the Singapore Symphony Orchestra conducted by Hoey Choo, follows the symphony with one such set of shorter pieces, the Turkish Fragments. There are four fragments: A Caravan; At Rest; The Night; and At the Festival, and each is highly evocative. I prefer an older recording by the USSR Symphony Orchestra which captured the mood that much more - you can hear the winds around the caravan - but this was still a good piece of work. The album closes out with Turkish March, which usually follows the fragments. Ippolitov-Ivanov wrote some good marches, so if you like marches look them up. There's also the Jubilee March and the Georgian March which is the last piece in the second set of Caucasian Sketches. For today's listening I turned to Anton Arensky. Initially I was looking for a concerto, but the most recent release (in fact the two most recent releases) was of his two piano trios, so how could I go past them? 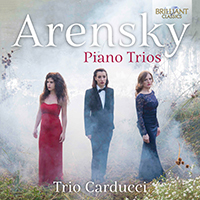 I picked the most recent, performed by Trio Carducci. Why was I looking for Arensky? Who is he? Good questions, which I would follow by why isn't he better known? Anton Arensky was a Russian composer who came between Rimsky-Korsakov (his teacher) and Rachmaninoff (his student). He is best known for his short pieces for solo piano, but that is a crime. His piano concerto is magnificent and, personally I prefer it to Rachmaninoff's (hear the howls of heresy). So, his piano trios? Not as brilliant as the concerto, but still damn fine pieces of music. They're strong for chamber music, and the performance here is powerful, you lack nothing for fewer instruments than an orchestra here, but they can still bring in the appropriate pathos in the slower movements. There is a wonderful use of the three instruments in concert, they really work together here to produce that strong sound. If you have Spotify you can check them out yourself here. Opening this morning's listening, Music Antiqua Koln with a selection of German Chamber Music Before Bach (which is the album title funnily enough). It is mostly a collection of Sonatas, which meant something a little different in these early Baroque times to the more famous idea of a Sonata in Classical and Romantic periods. There is some ephemeral quality missing in these pieces, I'm sure musicologists don't find it so hard to define, but for me it's the stamp of JS Bach. That absence is not a lack however, it may even be a boon as the composers were not moulded by one man's genius and influence into something else but were what they were. The sonatas are beautiful, I particularly love the one by Buxtehude who has over the past few years become a favourite early composer of mine. An exciting discovery for me though is Johann Paul Von Westhoff's Sonata 'La guerra', which has more movements than any of the others on the album, but they're all quite short. Each movement is very distinct in mood and the piece overall is a musical journey I hope to take again. The last third of the album is devoted to Pachabel, the man who wrote that blasted Canon that eclipsed all the other work he did, which was a lot. Music Antiqua Koln sets some of that right with this recording of his Partie (Suite) in G, which surely rivals any suite Bach wrote. It is a sweet suite, rich in texture and tone, and nothing like the (in)famous Canon - which immediately follows it on this recording. It is a lively and swift rendition, much better than those slow schmaltzy ones that have made it as hated as it is loved. In fact, this version of the Canon may help you fall back in love with what is, after all, a very good piece of music. And, of course, being a decent group and great album, after the Canon comes the Gigue - they were written as a pair - and the Gigue is wonderful. Inspired by Westhoff's La guerra sonata I looked for more of his music for the next album to listen to. I found a recording of a set of six Solo Partitas for violin performed by Gunar Letzbor. It was a good album, I enjoyed the music but it did drift into the background (which is good when studying of course). Two movements did stand out, a Sarabande from the Partita in A minor was the best, very emotive, and I added it to my Swoon playlist - not something that usually happens to Sarabandes. The other was the final movement on the whole album, a Gigue in D. Apparently I like Gigues. Having heard a bit of his clarinet quintet on ABC Classic FM on the drive to work, I decided I'd listen to Mozart's Clarinet Concerto first today. It's a long-time favourite of mine and it's been a while since I listened to the whole thing. So I did a search on Spotify to pick a version. Too many options, but I couldn't go past Sabine Meyer with the Berliner Philharmoniker conducted by Claudio Abbado. It's a 1999 recording, which I refuse to admit was 20 years ago. The recording is crisp and clear, as is Meyer's playing which breathes life into the phrases so they aren't simply demonstrations of her virtuosity, but vivid expressions of life and joy. This empathetic playing is even more realised in the next piece on the album, Debussy's Premiere Rhapsodie. This was a new piece for me but recalled some of Debussy's more ethereal moods. Which flowed nicely to the last piece on the album Toru Takemitsu's Fantasma/Cantos, a truly ethereal piece conjuring a dreamlike world of mists and hidden creatures, wonders and dangers. In all the album, named as a list of the works on it, is a great example of Meyer's brilliance - and that of the Berliner Phil - and a delightful listen in general. Highly recommended. Inspired by the Fantasma/Cantos I went to Takemitsu's page on Spotify and found there are several albums of his complete piano works. I went with the most recent, recorded last year, featuring the playing of Lukas Huisman. As soon as I hit play I was in unfamiliar territory. Short phrases, rising and falling, stillness in the motion. Often when I've heard something like it there's been troubled emotion beneath the music - the despair and anger of Shostakovich for example - but here it wasn't so. Trouble yes, perhaps even sorrow at times, but only times. More, it seemed to be the vibrations of life. The rain breaking the surface of the water, the movements breaking the stillness of a body at rest. It is that moment, the one between stillness and breath, that Takemitsu's music captures. For me at any rate. I can't say it's a lulling place, quite the opposite, but not stirring either. It is a beauty of which I am completely unaware, although I recall a philosopher, Lyotard I think, saying that it is in the moment of something happening, after it hasn't but before it has past, that isolated moment of pure action and existence that is the sublime. Hello, this year I plan on sharing a little on what music I'm listening to while studying. Brief album reviews basically. Today I face the choice of which album I want to download from the Naxos Newsletter this month. There are three options every month from the considerable catalogue Naxos has grown over the years. Sometimes I find the choice straightforward, but today I'm listening to two of them before I decide. The first is a 1990 recording of Famous Operetta Overtures by J. Strauss Jr, Offenbach and Suppe, performed by the Czecho-Slovak State Philharmonic Orchestra conducted by Alfred Walter. It opens with Strauss's Die Fledermaus, which I'd always assumed meant The Field-mouse, but apparently means The Bat, so there's a childhood image shattered. The music is as lively and enjoyable as ever though and sets the tone for the rest of the album. Operetta, being a light form of opera, has wonderful overtures of vim and vitality, and jolly brass to match the rollicking strings. The music can be wonderfully evocative too of course, as the opening of The Gypsy Baron shows with its images of romantic intrigue and cloaked anti-heroes. Naturally, Suppe's Light Cavalry Overture is included and given a typically thrilling rendition, although I think I have heard stronger ones. The album ends with Offenbach's overture to Orpheus in the Underworld, featuring the famous can-can, which is a deserving conclusion to the music. The second choice is The Art of the Vienna Horn, part of a series of albums featuring soloists from the Vienna Phil, in this instance Wolfgang Tomboeck. Apparently the Vienna horn was a precursor of the double horn, but because of its distinctive sound the Vienna Philharmonic have kept it, particularly for works by Bruchner, Brahms and others who wrote specifically for it. The album opens with Beethoven's Horn Sonata, Op 17, gives us a Schubert lieder, then a horn/piano duet by Schumann, and ends with a Trio for Piano, Horn and Violin by Brahms. The Vienna horn seemed to me more muted than most brass and this gave the music a damper touch. It felt like I was listening to Romantic-era chamber music (as I was) through a hollow tree. There was something green and earthy there, but also removed and vaguely dissonant. Or perhaps that's my protracted mind listening to something while hot, tired and reading about imperial historiography. So which to get? Despite the former album's energy and my nostalgia for an overture that has nothing to do with field mice except in my mind, I'm going to download The Art of the Vienna Horn. The music is less familiar, less commonly played, and I feel deserves further listening to appreciate its subtleties and beauty that may have been tarnished by distraction. 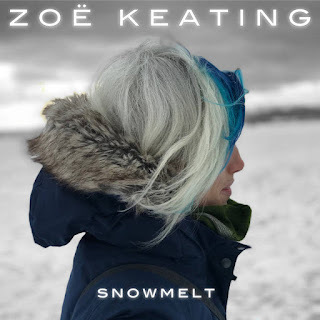 The opening chords of Zoe Keating's new ep evoke a stark icy landscape. This rapidly is broken up by rocks, then the life beneath emerging in a spring thaw. And this is just the beginning. Snowmelt is Keating's first new music in a few years, and comes with the byline, four songs for the end of a long winter, and the winter is definitely more than seasonal. Zoe has been to the barren frozen lands of grief, even without knowing about her life, the sorrows of Icefloe, the second track, can only be created by someone who has spent time there. The tracks don't try to brush this off; a stay in such a place leaves permanent marks, but the music is a journey back through the tundra to the forests where I met Zoe on her last solo album (Into the Trees, 2010). Touched, remembering, but alive and ready to continue the adventure. This is very clear in the deep, beating rhythms of Possible, the third song, which has flights of beauty over the resonating pulse; it is possible to escape the desert. The final track, Nix, is the relief of the end of the journey, the moment of rest before the next chapter begins. In all, Snowmelt is a stunningly beautiful set of songs that gives solace and invites hope. I listened to it on Bandcamp, it's also available on Spotify and iTunes. As I drive I leave myself at the mercy of the radio presenters of ABC Classic FM. Little did I suspect Greta Bradman would make me listen to a cat bathing. Specifically, Hiroshige's cat, not a cat I know even. It was a wonderful experience, and I'll listen to it again. Hiroshige's Cat Bathing is part of Alan Hovaness's Piano Sonata, Op 366, so it's not as weird as all that. It's a languorous piece, perfect for a Sunday morning, and oddly meticulous - so just like a cat bathing itself. So I highly recommend checking it out for two reasons. First because it is beautiful, and second so you can tell people you're listening to Hiroshige's Cat Bathing, just for the reaction.